The completion of phase one of BGY’s masterplan delivers modern red brick buildings housing new sports facilities and sixth form accommodation. 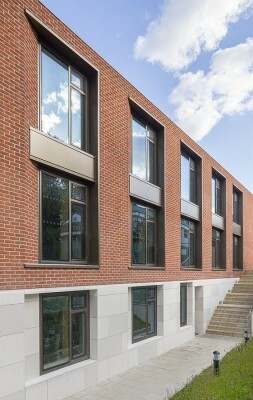 Phase one of BuckleyGrayYeoman’s masterplan for Channing School in Highgate, London, has completed. The £5.5 million, 1645 sq m project provides new sports facilities and Sixth Form accommodation in modern brick-built buildings that overlook north London from the school’s campus at the top of Highgate Hill. The completed buildings will be followed in 2016 by an additional building for Performing Arts, completing the largest building project in Channing’s 130-year history. “The Sports hall and Sixth form building at Channing School will allow the school to provide its pupils with the most up-to-date facilities to support its high quality teaching and curriculum. “Channing School is very pleased with the new sixth form centre and sports hall. The buildings have provided facilities which our entire community are justifiably proud of. We are particularly pleased that our sixth form can now study in its own specially designed area, which will be a fantastic stepping stone to University life. “The Sports Hall is truly inspiring, and represents a massive commitment by the school to further developing excellence in sport, as well as providing a space which can accommodate the whole school for assemblies and other major events. BuckleyGrayYeoman’s masterplan was developed in response to a limited invited competition to create a vision for the new schools facilities. The grouping of the new buildings towards the southern end of the site in close proximity to the existing school was intentional to conserve and maintain the ‘green landscaping’ to the north whilst creating a ‘campus’ feel set around a new courtyard. 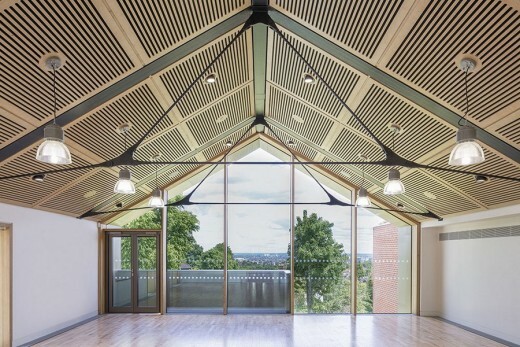 The alignment with the school’s historic Founders Hall, and the dimensions and pitch of the new roofs mirror that of the existing building, creating a strong visual effect of continuity from one building to another. The orientation of the buildings defines a new ‘village green’ that will form the heart of the school, with landscaped amphitheatre seating, play spaces and covered walkways to connect the school’s departments. A new 4 badminton court sports hall sits below two of the three roof ridges, creating high quality indoor sports facilities for badminton, hockey, netball and cricket as well a fitness suite, changing rooms and teaching rooms. Sixth Form accommodation has been created in the upper floors of the third pitched volume, a difference in use which is expressed in the plan of the buildings by setting back the eastern wall of this volume in relation to the wall of the sports hall. 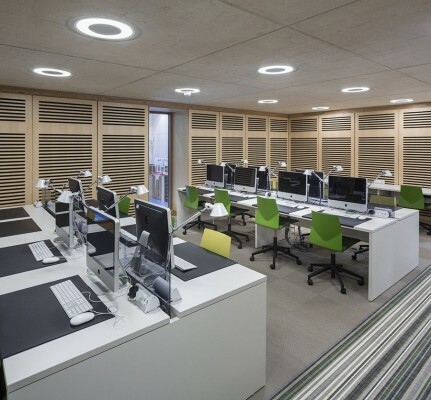 The new Sixth Form provides a new dedicated IT suite alongside a range of teaching spaces that create the opportunity for university-style seminar teaching sessions. Channing school sits in a conservation area and the school campus has a strong built heritage, which includes listed buildings. 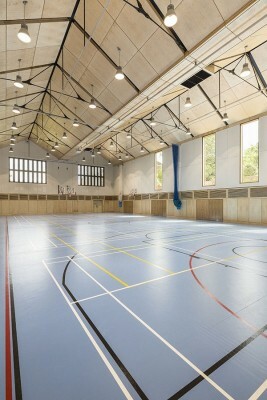 BuckleyGrayYeoman worked with the slope of the hillside, making excavations to level the site and keep the roofline level with that of the existing Founders Hall while still providing a sports hall with a high enough ceiling for current Sport England standards. High quality materials were chosen throughout the project. The predominant red brick material was selected in response to the architectural context within and around the site. 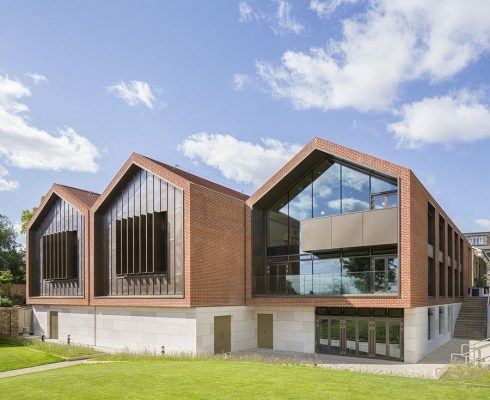 The handmade bricks have a visually pleasing natural variegation of colour and texture and enabled BuckleyGrayYeoman to create a number of special brick shapes to complete key building details such as the chamfered window reveals. Traditional lime mortar was used to minimise the need for movement joints, resulting in a crafted, sculptural finish. The three parallel ridges of the roof help to visually break down the large volume of the sports hall. The roofs have been constructed with concealed gutters, expressed brick gable ends and chamfered brick eaves to maintain the high quality use of brick detailing present throughout the scheme. The ends of the building are glazed in the case of the Sixth Form accommodation and filled with a mixture of standing seam copper cladding and glazing for the sports hall. The interiors are robust and flexible, with large open-plan rooms extensively lined with oak veneered panelling. The ridges of the roof are open to the interior, creating double height rooms in the upper floors of the sixth form accommodation and adding to the height of the sports hall. Exposed tension trusses express the structure of the building. The building is arranged around in-situ cast concrete stair cores and exposed fair-faced concrete soffits feature throughout, working to provide passive climate control by exposing the thermal mass of the building. Windows are openable and the building is predominantly cooled by natural stack ventilation.